WOW! Who wouldn't want this fellow!!! "REBEL THE DOBERMAN & ROTTWEILER MIX PUPPY"
I am a sweet & very smart puppy and am already crate trained and 90% housebroken. I love all dogs of all sizes, love cats and I was left abandoned to fend on my own. COME ONE COME ALL, IT'S A PARTY! Annie's Garden Party! Everyone is invited. 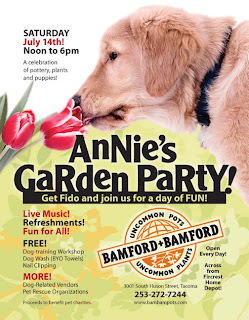 It's a celebration of Puppies, Plants and Pottery and it's being held at Bamford and Bamford's new location at 3001 South Huson Street, right below the Home Depot in Fircrest (right off Orchard Street). In truth, it's a major fund raising event for several very good pet rescues, including Peninsula Spay and Neuter Project and it's sister group, Coalition Humane, Northwest Greyhound Advocate Program and Ginger Luke's Pet Rescue, which takes death row dogs and helps to foster and rehome them. As you'll see on the flyer, we're offering dog washes, nail clipping (and we're hoping for micro chipping) services for donations as well as raffle items. I'll be there giving a class and a seminar on dog training, Kate Johannson, another trainer will be there from Sit Means Sit, there's going to be music and refreshments. And, if that isn't enough, Bamford & Bamford sells incredible items for the garden. They have exquisite imported pots, lovely plants and fountains. We will also have vendors from the area setting up booths and selling their pet related goods. It should be a great event - don't miss it. Uneek Treats will be there! Come by our booth and get a box of the best treats on the market today! For those of you who are interested in helping, we're looking for people who can help with taking donations, directing traffic and keeping traffic flowing (we're expecting an enormous crowd) and making sure the dogs have fresh water. We're looking for some teenages who can help with the dog washing. We will offer the dog washes from noon to 2:00 and then again from 4 - 6:00 and the folks doing it will have 30 minute shifts, so hopefully, we will have enough people to make that work. If any of you know teenagers or young people who might be up for this, please let me know. We just made up his name. He is 7 months old, as sweet and energetic and healthy as they come. The shelter is full and he will die Fri. if we can't move him. He appears to be a chesapeake bay retreiver mix and is a big YUM. 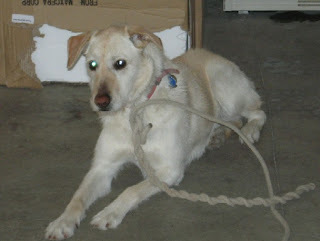 Please email me or Yvonne at alphamom33@aol.com Thank you on Chessie's behalf. Wow, what a great way to start the week. Remember Me? Many of you have diligently checked on the progress of this doll. who are teaching her how to go up down stairs! The lovely terrier, lab girl is free, free, free, to finally, finally, be. Chain Off 2007 • Unchain the 50! This Year's 4th of July Event marks our 5th Annual Chain Off, and we're going More Grassroots than EVER, with a Goal of at least ONE PERSON per state living chained to a Doghouse for 8-24 hours in our Fabulous "Unchain the 50" Campaign! We're excited to announce TWO Main Unchain the 50 Events, East Coast and West Coast. The East Coast Event will take place at Piedmont Park, Atlanta, Georgia, details are below, and the West Coast Event will take place at Marymoor Park near Seattle, Washington. A very special thanks to Susan Hartland and Pam Cheatham for their hard work in setting up the locations. Tammy Grimes will live chained in Atlanta for 24 hours June 30-July 1; anyone else who would like to represent their state by coming and living chained with Tammy is cordially invited. Or, chain yourself in your own community or front yard, the choice is yours. We are lining up speakers, booths, and other events ongoing for the two days. All rescue groups are welcome to set up tables and bring rescued dogs for adoption. Please e-mail Dawn@dogsdeservebetter.org with details. Dear Animal Lovers, It has been a long time since I have announced a one day 24 hr deadline ! Can you please help SAVE this dog !!! --------------------------------------------------------------------- "RUKA the DOBERMAN MIX"
My name is Ruka and I am a one year old Doberman Mix. I am spayed, up to date with all my shots, housebroken and a very joyful, loving & smart Dog! I get along great with people of all ages and other dogs but I just can not get along with any cats. I know several commands in English and German!!! I just love to play with everyone ! I am going to be put down tomorrow unless someone can foster or adopt me. "WILL YOU PLEASE SAVE ME AS I ONLY HAVE LESS THAN 24 HRS LEFT!" "7 Adorable Labrador Retriever Puppies Looking for forever homes!" This Event Sound Fun! Check them out! 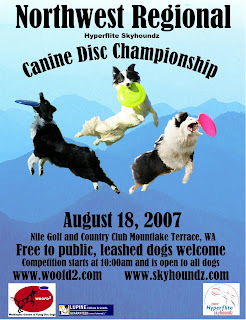 Washington Owners of Flying Disc Dogs (WOOFD2) is proud to host this year’s Hyperflite Skyhoundz Northwest Regional Championship at the Nile Golf and Country Club in Mountlake Terrace, Washington. Participation is open to all residents of the Northwest region and top finishing teams will qualify for invitations to the 2007 Hyperflite Skyhoundz World Championships in Atlanta. WOOFD2 competitions are open to all dogs, including mixed breeds. WOOFD2 is a non-profit organization dedicated to having fun with our dogs through the sport of canine disc by organizing performances and competitions through private and community events. 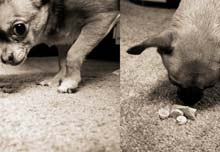 We promote responsible dog/owner relationships and encourage safety, good sportsmanship and positive training methods. In addition to competitions WOOFD2 performs exhibitions throughout the Northwest and has performed for a variety of groups including college and professional sports teams, county fairs, 4-H groups and animal shelter fundraisers such as, the Marysville Poochapalooza, Seattle’s Furry 5k, Pierce County Dog-A-Thon, and Kirkland’s Party in the Park. The disc dogs are always a crowd favorite! Annie Needs a Loving Forever Home! The sad stories just break your heart. This is Annie, just 8 months old. She was dumped out of a car, picked up by a good samaritan, who can't keep her. We have only until this weekend to find her a place or he will take her to the Everett Shelter, where she will be euthanized. She is so beauitful and deserves a chance. This girl currently lives with 2 other dogs and is very sweet. Can anyone help? 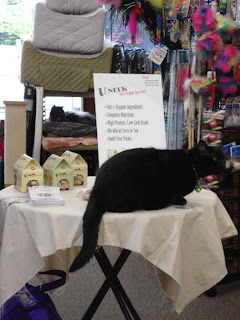 Uneek Treats had a great day at Crown Hill Pet Supply. I got to meet some great folks and tell them all about our treats. Right when I got there, Simon the cat came to greet me. He promptly made himself at home on our table. He is apparently a bit of an attention hog. I kept telling folks we make treats for dogs. They were having a hard time believing me with Simon laying on our samples. 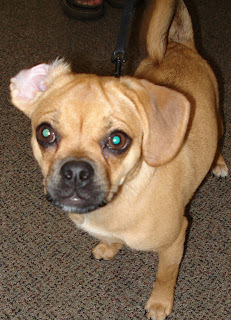 I had fun meeting Luke a Pugle, Pug and Beagle mix. Talk about energy. She was all over the place. Luka was running so much she even messed up her hair. Roberto was soon to follow and what a handsome fellow. He was a rescue from petfinder.com and got his forever home. How great is that! I met Myla, who is a great photographer. She did not have her girls with her but sent me a photo. Please check out her stuff. You will be most impressed! Thank you Crown Hill. We look forward to another time! Hello, are you my new Mommy or Daddy? My mom moves to San Diego and the armed services don't apy enough for my family to keep me. They leave on June 15th. 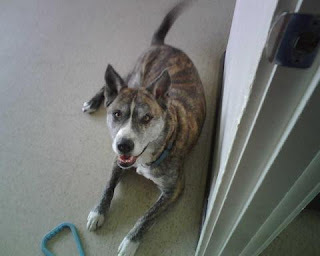 I am Alex a 4 year-old mixed breed dog loving and playful looking for a fun and loving home. 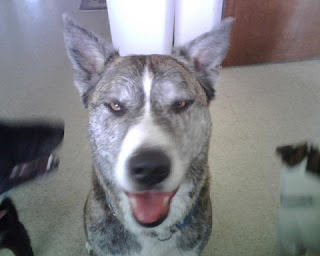 Current on all shots, has wire kennel, food bowls and toys. Alex is willing to be trained spent most of his life indoors and I am looking for a home that is patient about teaching him how to walk with a loose leash, take him on long walks and play-tug-o-rope, and catch. He is very smart and can figure out how to get out of most anything. We are moving out of state and we are unable to take him with us, he has been in our family since 1 year old and he loves car rides! I am excited and nervous about finding him a good home. We are looking for a permanent home with a fenced yard, a sister or brother, he can run around and play hard with and then have a warm and loving place to sleep. Alex is great with my son and neighborhood kids he enjoys running around with the neighborhood dogs (sometimes he gets out and does not want to come back until he is ready). He is curious about other animals, and has never acted aggressively towards anyone. 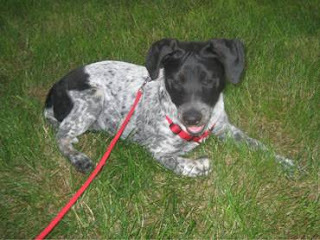 He loves to run, and would love to learn how to run and walk on a leash. We want a family that has experience with dogs and is willing to make Alex a permanent part of their family. 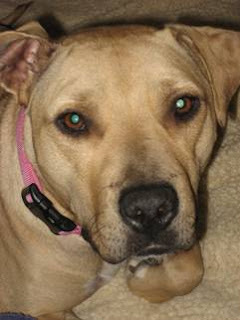 Honey is an incredibly sweet, playful, and charismatic 2 year old female Pit Bull. She is currently being fostered with a Chihuahua brother with whom she is dying to become playmates with…however she needs someone more her own size to romp around with! She likes to play outside very hard, and is very sneaky when it comes to stealing and hiding shoes lying around the house. Honey had patella surgery a few weeks ago and will need extra care until she is fully healed. She is looking forward to playing in a large yard and hopefully having an equally lovable playmate. She has shown no sign of aggression whatsoever with her current older male “step” brother. Honey is full of love and has a frolicsome personality unique only to her. 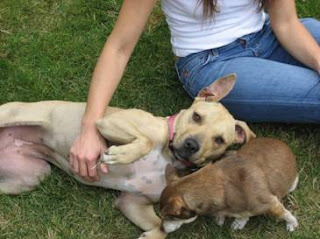 Honey will require special attention for her knees for the rest of her life. This certainly doesn’t slow her down, she loves to be outdoors, and even running will most likely be possible in the future. Someone understanding of her health history is a must. 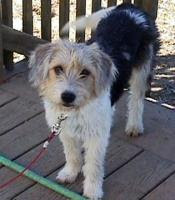 She would do well in a home with at least one other dog or a multiple dog household. She’s had very limited, closely guarded interaction with cats, but seems somewhat uninterested and does not have a high prey drive. However, strict supervision would be necessary as with any dog and cat who’ve just met. 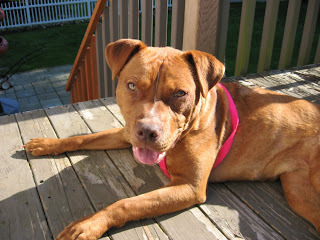 If you are interested in fostering or possibly adopting Honey please contact Carina at ProjPlus@QWest.net. the pointer coloring. Amazing they weren't killed by cars, without a doubt dumped. No people around. 4 abandoned puppies were rescued by a kind woman in Startup WA, near Monroe/Sultan. These puppies amazingly stayed alive in spite of being dumped in an open field next to busy Highway 2. It is four females, roughly 4 to 5 months old, with Pinter in them and something unidentifiable at this time, their fur curls a little and they are adorable." LULU is at a sanctuary in Virgina that is being forced to shut down and any dogs not in a rescue or home will be euthanised at the end of the June. them. If a home visit is not feasible we will be unable to adopt to you.We do not have a facility but rely on foster homes, the more foster homes we have the more dogs we can save. Adoptions include up to date shots, spay/neuter, heartworm testing/treatment/prevention, worming/deflea, registration with Petwatch, microchip/tattoo, health certificate and testing, transport to Calgary ,1 month health insurance, great deals with trainers and a doggybag to get you off to the right start with your new family member and lifetime support. with saving dogs from at risk situations, we are 100% nonprofit volunteer rescue that relies on donations to continue our work, we receive no government grants. moment and running ads inTexas newspapers, and the calls and letters made an enormous difference. the full support of the Governor and the Illinois Department of Agriculture! attorneys are fighting back in every way they can, but we need your help. urgent need for passage of the American Horse Slaughter Prevention Act (H.R. brutal slaughter in large numbers. of American horses in this country or over the border. of H.R. 503/S. 311 in Congress! We Need You! A Lost Home and a missing Dog! RAVEN A CHOCOLATE LABRADOR Renton - Talbot Hill Area! 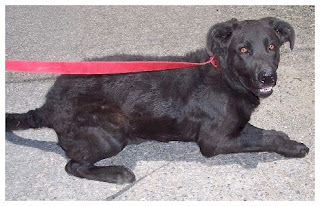 Raven a Chocolate Labrador was hit by a car on Memorial Day and she ran off in the Renton -Talbot Hill Area. 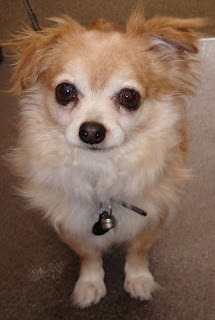 Owner Heidi would like to know if there is any Boeing Employee who can enter the Triton Towers to help locate this dog? There is No Collar, No ID & No Microchip. 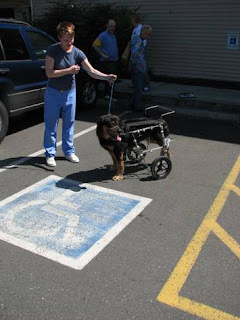 The owner Heidi is devastated with huge regrets for not havingany kind of proper ID on her missing dog ! There is a nice reward if you return this dog back to her. I WAS ADOPTED! YEAH!!! 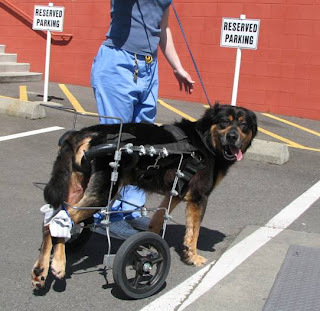 There's very little question on as to why this dear dog was left at the Tacoma Shelter. 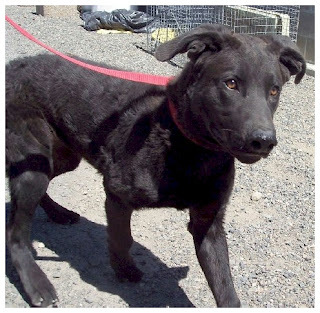 We will do what we can with financial support if someone can care for his needs and save him from the needle because of the back legs problem. I don't know if it is repairable and if someone takes him it should be unconditional. He is not under my rescue so I have no further information about him. If we could work together to help him that would be the best. Thank you. 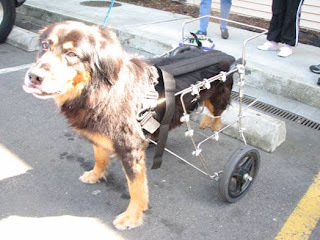 Pasado's cannot take him & I've emailed Judith @ Old Dog Haven. She can't take him either. Pasado's is full & we cannot bring a dog like this to the farm anyway. he was moving well in it. If you could let me know if you can help, I'd appreciate it.